Broadband @ Home » Broadband Types » Satellite Internet or 4G: What Offers the Fastest Service? Deciding between satellite Internet service and a 4G wireless connection depends on a variety of factors. While it can sometimes offer speeds that rival those of cable or 4G services, satellite broadband comes with other limitations. In most cases, your bandwidth will be throttled during peak usage times, which are normally during the day. Let’s take a look at whether Internet service delivered via satellite makes sense for you. In certain rural areas, satellite service may be your only option for broadband-level Internet. While 4G coverage is expanding, especially on the Verizon Wireless network, you may find 4G service to be spotty in your locale. Satellite Internet providers know they essentially have a captive audience when it comes to providing broadband access in rural regions. The fastest satellite providers are able to reach speeds of close to 15 Mbps, although expect something in the range of 5 to 8 Mbps to be a typical speed. A standard 4G network speed falls somewhere between 15 and 20 Mbps, depending on the carrier and the current network traffic level. So, 4G service is generally faster than satellite, provided that coverage is available in your area. Watch Out for Limited Bandwidth! 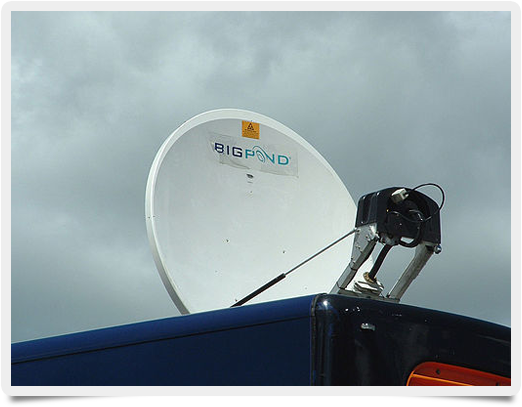 The bandwidth limitations of a satellite Internet service can be very frustrating. Most providers have a daytime bandwidth limit in the range of 10 to 20 GB of data per month, which definitely puts a hamper on the amount of video streaming you can do. Nighttime bandwidth limits also exist but are generally larger than their daytime equivalents. If 4G service isn’t available in your area and you’d like something faster than dial-up speed, satellite Internet may be your only option. However, a combination of trees blocking your satellite view and a lack of 4G coverage in your area may limit your Internet options until 4G service becomes more ubiquitous in rural areas. In that situation, be sure to research the coverage areas of the different wireless carriers before choosing an Internet service provider. Ultimately, 4G generally offers faster speeds than satellite Internet but may not be available everywhere, and the bandwidth limitations of the latter definitely put a crimp in your Internet experience. Carefully research all of the options available in your region before making your decision.